Feel free to contact me for any musical problem.. While in school he won first prizes in national and international concourses. In 1981 he started his teaching career in the Italian public schools, and since 1982 he has taught at Scuola Media G. Fassi in Carpi (now Istituto Comprensivo Carpi 2). In the early 90s he started studying computerized musical technologies with an emphasis to educational and performance aspects. He attended training courses of a high specialization level and started computer projects at school, where he run for many years workshops of music and computer. In the following years he has been asked to teach courses in computer science and musical computer technologies for students and teachers in many Italian institutions. He has worked with theatrical organizations, workshops and hypertexts and has become an expert of computerized musical technologies. He worked on nine editions of the “Pavarotti & Friends” event, as assistant of arrangers and person in charge of orchestral music. He’s co-founder of the Nubilaria Clarinet Ensemble, with which he realized several prohects, among them two CDs, and for which he wrote many arrangements, transcriptions and original compositions. He founded the Schubert Trio, with soprano Valentina Galullo and pianist-composer Elena Cattini, with the aim of deepening and broadening the repertoire for such organic. 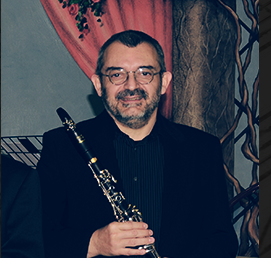 He’s very active as professional clarinetist and works regularly with publishing houses in Italy and overseas. His works (compositions and transcriptions) are published by Ut Orpheus in Bologna.